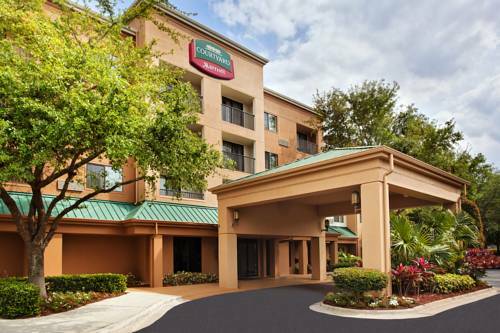 The Orlando/Maitland/Altamonte Springs Courtyard by Marriott is located in the Maitland Business Center. We are conveniently located off Interstate 4 and Maitland Boulevard. We are close to the Pembrook Commons, the Maitland Preserve, the Maitland Summit Park, and the RDV SportsPlex. We are 8 miles east of Downtown Orlando. We provide a complimentary shuttle service Mon-Fri to and from local businesses and restaurants within a 3 mile radius of the hotel. The Bistro offers healthy choices; a variety of breakfast selections, numerous dinner options, an evening bar, and 24 hour specialty beverages made with Starbucks coffee. Relax and unwind in one of our 112 spacious guest rooms. Enjoy our pool, whirlpool, and exercise room. Our Market is open 24 hours per day. For our tech savvy guests, we offer free high-speed wireless Internet access throughout the hotel. Pose in an electric chair! Stretch your neck beneath a guillotine blade! It'll be the closest that you'll ever come to capital punishment -- as long as you obey the law.